As an important branch of molecular science, synthesis of polymers with desired molecular topologies is of great significance in developing new matters and materials with novel functionalities and properties. Aided by recent advances in living/controlled polymerizations, there are great opportunities not only to prepare polymers with new structures and functionalities, but also to improve the ability to tune the functionalities and properties through chemical design. In comparison with the corresponding linear counterpart with similar molecular weight, graft copolymers containing a great quantity of side chains chemically attached onto a linear backbone are endowed with fascinating properties including wormlike conformation, compact molecular dimension, and notable chain end effects resulting from their confined and compact structures, which made graft copolymers easily self-organize into stable nano- or micro-structures with diverse morphologies that may find their applications in hybrid materials, biological or medical aspects. On the basis of molecular design and using controlled radical polymerizations combined with the synthesis of functional monomers and modification of polymer, the research group of Prof. Xiaoyu Huang of Laboratory of Materials Science at Shanghai Institute of Organic Chemistry, CAS, synthesized a series of well-defined graft copolymers with specific composition and structure, which included well-defined graft copolymer with hydrophilic backbone (Macromolecules 2006, 39, 4945), centipede-like graft copolymer bearing different side chains (Macromolecules 2007, 40, 4486) and well-defined graft copolymer with tunable grafting density (Macromolecules 2010, 43, 117; 2010, 43, 262), and the corresponding self-assembly and application studies of the copolymers (Macromolecules 2009, 42, 4249; J. Mater. Chem. 2008, 18, 4332). Because of these outstanding achievements, they have been invited to write a tutorial review article entitled Well-defined graft copolymers: from controlled synthesis to multipurpose applications (Chem. Soc. Rev. 2011, 40, 1282) for the Chemical Society Reviews (IF = 26.58) of Royal Society of Chemistry. The series of works were financially supported by National Natural Science Foundation of China, Ministry of Science and Technology, Chinese Academy of Sciences and Shanghai Municipal Science and Technology Commission. 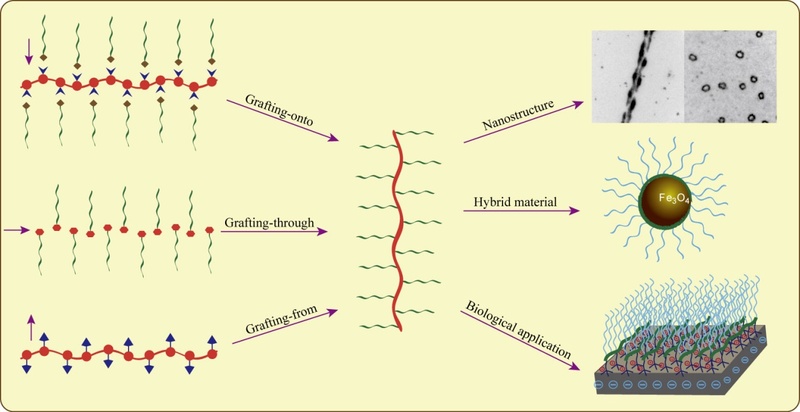 Synthetic approaches towards the construction of well-defined graft copolymers and applications of these interesting macromolecules.